Faults, especially fault bundles, elevate the difficulties of predicting, preventing and controlling water inrush during coal seam mining. This paper takes the no. 163 mining area at Jiangzhuang Coal Mine of Shandong Province, China, as a case study. A series of faults form structural patterns consisting of the graben-horst and fault terrace in the study area. The key technical challenge lies in fault activation, which affects sizing of economic and safe coal-pillar around the fault bundles. An innovative numerical simulation technique was applied to understand the movement law of coal seam roof and floor and fault activation among the fault bundles under different mining plans. The results show that reasonable arrangement of mining sequence in the working faces is an effective method to reduce the influence from faults. In addition, coal seam roof and floor damage and faults activation are different during mining under the graben-horst and fault terrace settings. Moreover, the horizontal and vertical displacement values of each point on fault plane of hanging wall and footwall indicate that the maximum displacement is related to roof water-conducting fractured zone and floor damage zone, which increase the probability of fault activation. Based on the research results, a reasonable coal-pillar width was designed beside the fault bundle in the no. 16301 working face of the no. 163 mining area, and the mining was completed safely with significant economic benefits for Jiangzhuang Coal Mine. The online version of this article ( https://doi.org/10.1007/s12665-019-8142-2) contains supplementary material, which is available to authorized users. This research was financially supported by National Key R&D Program of China (No. 2017YFC0804101) and National Natural Science Foundation of China (Nos. 41402250 and 41702305), and Graduate Science and Technology Innovation Project of Shandong University of Science and Technology (No. SDKDYC180319), and Taishan Scholar Talent Team Support Plan for Advantaged & Unique Discipline Areas. 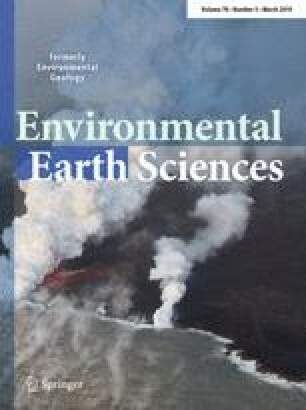 The authors would like to thank technicians in Department of Geology and Survey in Jiangzhuang Coal Mine. We thank anonymous reviewers for constructive comments on the draft, which greatly benefited the manuscript.